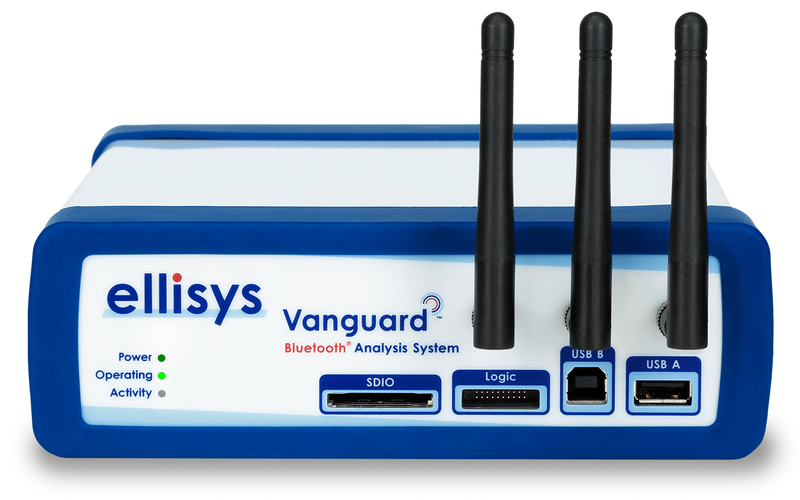 Geneva, Switzerland — September 18, 2018 — Ellisys, a leading provider of test, certification, and analysis solutions for Bluetooth®, Universal Serial Bus (USB), Wi-Fi®, and other technologies, today introduced a major innovation to its industry-leading line of Bluetooth analysis solutions. Available on the recently released Bluetooth Vanguard™, the Bluetooth Capture Diversity™ feature utilizes two concurrent Bluetooth capture engines and sophisticated software algorithms to optimize capture quality and provide for increased flexibility in the placement of the analyzer and antennas relative to devices under test. Bluetooth Vanguard and the Capture Diversity feature will be on display and demonstrated in Booth 226 at Bluetooth World, taking place today and tomorrow, September 18-19, at the Santa Clara Convention Center, Santa Clara California, USA. How Does Capture Diversity Work? Bluetooth Vanguard employs three reception antennas. Two antennas are used for Bluetooth and one for WPAN (IEEE 802.15.4), with Wi-Fi (3x3 11ac) sharing all three. Each capture engine provides identical wideband capture capabilities, where all packets on all channels, from all nearby devices are captured. The two Bluetooth antennas may be angularly displaced to better optimize reception, or externally cabled to be positioned nearer the desired device or topology under test. In all past Bluetooth capture methodologies, from any vendor, the analyzer had to be placed at an optimum location to minimize the analyzer’s reception of packet errors. This approach often requires some experimentation and can be time-consuming. Missed critical packets can lead to confusion and lost time. A further improvement involves the use of software algorithms to make a good packet from a bad packet, as one antenna may receive a given packet correctly, and one may receive the same packet incorrectly, for a variety of reasons, including interferences. In addition, in some cases the packet can be received incorrectly on both antennas and one good packet can be factored from the two bad packets. Bluetooth Vanguard is an all-in-one, fully integrated system supporting wideband (all channels) capture and analysis of Bluetooth Classic (BR/EDR), Bluetooth Low Energy (LE), plus concurrent Wi-Fi 3x3 11ac, all 16 WPAN (IEEE 802.15.4) 2.4 GHz channels, raw ISM spectrum capture, Bluetooth host controller interface (HCI) protocols (USB, UART, and SPI), Audio I2S, WCI-2, and generic protocols including UART, SPI, I2C and SWD, all visualized over the widely adopted Ellisys software suite. Bluetooth Vanguard supports one-click concurrent, synchronous capture of the wired and wireless communications technologies listed below. Vanguard is sold in several field-upgradable configurations to meet customer requirements and budgets.